If you spot an ant or two at home, never expect it is just a coincidence. They will come back with many more troops—especially if they have found food and water sources around. Buying a homemade ant trap might solve ant invasion problems at home, but the ready-made ones are usually too chemical and can be harmful to your children and pets. Read until the end of the article to find how to make a DIY ant killer and trap. Ants are tiny, skinny insects. Ants always live in colonies, and each of them has a few varieties of ants. All the ants in the colony are the same species even though they differ in appearance. The ant workers are female, but they cannot breed. They work hard in the nest to protect it from their enemies and predators. Some ant workers with a larger size have big jaws to hunt for food and protect their nest while the smaller workers are responsible inside the nest to take care of the larvae and pupae as well as do the digging. The queen that is in the nest—except when the mating season begins—lays the eggs. The queens and the males are the ones that have wings. They will fly out of the nest to mate and build a new colony. 2. What do ants look like? Ants are tiny insects closely related to wasps and bees based on their three areas of the body: head (with an antenna), thorax (chest), and abdomen (stomach), as well as three pairs of legs. Unlike their relatives, ants are wingless, except for their queens that mate and breed. Ants also have big heads, antennae on their elbows, and very strong jaws that can rip and grip pieces of food that are much larger in size than the ants themselves. Speaking of sizes, on average, most ants are 5-15mm long even though those of tropical species are 30mm in length. All ants can bite, but only some of their species can sting. They have numerous glands to produce chemical substances, including when they sting. Speaking of colors, ants are mostly brown, but some others are black. There are also some species whose colors are reddish and yellowish. 3. Where do ants come from? Since millions of ants come from over 11,000 species in the entire world, they are considered as important insects—particularly those that come from tropical areas. Not to mention the fact that ants can be found in almost all land habitats unless they have cold temperatures—especially the ant eggs and larvae that can only stand humid and warm circumstances. Nevertheless, adult ants can survive in dry conditions. Most ant species build their nest underground, some others nest in the trees, and some very tiny ants make their nest in small hidden places, like acorns. 4. Do ants cause problems? Even though ants are important insects, they can be disturbing pests. 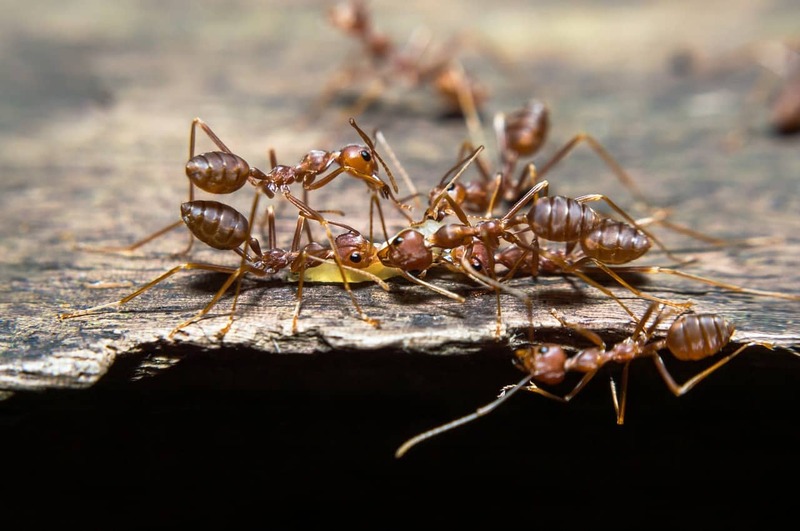 Sugar ants make their way to your house to look for food and water sources while carpenter ants build their nests in wood—of course, including your house as well. Leaf-cutter ants are the species that feed on crops in the fields while fire ants sting and cause burning pain. Now, let us turn the focus to making a homemade ant trap. 5. How to make a DIY ant killer? Certainly, it is much easier to buy ant killers, such as ant spray and ready-made ant traps. Plus, they also work effectively, but putting poison in every corner of your house is too risky if you have kids and pets around. So, why not making a homemade ant killer that is more natural and safer? No worries, making a natural ant killer with simple ingredients available at home is very easy and not pricey. Making a homemade ant trap means combining substances that ants love with substances that kill them. As a hint, ants generally love almost all ingredients—especially sweets, fats, and protein. Mix a tablespoon of sugar and yeast with two tablespoons of molasses altogether, then put a little mixture on small plates along the ant trails. Boric acid is an effective natural ant killer. The substance poisons the ants inside out as well as damaging their exoskeletons. To make this borax ant killer, you need to mix a cup of sugar, half a cup of water, and a tablespoon of borax. Pour the solution into a used plastic cup and sprinkle some sugar on the lid, so that the ants will get attracted to get inside the cup and eat the solution. Get a ¾ tablespoon of baking soda and powdered sugar, mix them in a jar lid, and place the bait where ants are lining up to get food. This natural ant killer baking soda will react with the acid in an ant’s digestive system and explode it. This is a safe homemade ant killer as it uses some basic home ingredients you usually use for cooking. All you have to do is combine equal halves of white vinegar and water. Then, pour the solution into a spray bottle and spray it on your target—anytime and anywhere. What you need to make this natural ant killer are ½ cup of purified water, one teaspoon of witch hazel, and 7 to 10 drops peppermint essential oil. Mix all the substances and put it in a 4 oz spray bottle. This homemade oil ant spray does not only kill ants but also repel them. 6. How do ant traps work? This question may make some of us hesitate with the effectiveness of the above homemade ant traps. However, we still have to be aware of how effective they are. How do the ant traps work? Find an ant trail or potential openings in your house from which ants get through, and then put the trap right there. Putting the bait along the ant trail will help the ants immediately find the trap and take it back to their nest. You do not want to put your traps randomly in your house as it will not work successfully, or it will take forever for the ants to find your traps. The bait will begin working as soon as the ants find it and take it back to their nest. You will then find that the number of ants that invade your house will reduce in no time. Good luck with that!